ou guys, I did it. I went through my closet and simplified! There was a small mix of emotions going through my closet. I've lost weight so a lot of the clothes were too big, so that was exciting but there was a pair of trousers that I'm still kind of sad about but hopefully they'll find their way into one of my friends' closets. 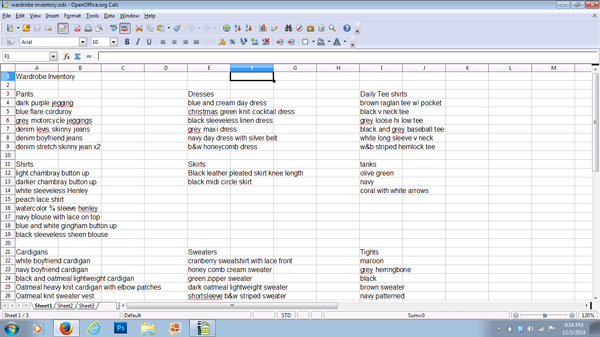 I even made an inventory list of what I have. I saw this idea on Pinterest and I thought it was stupid, but seriously I have changed my tune. It's nothing too exciting, no fancy colors but it does the job and helps me gauge what I need and what I don't. So check out this amazing sweater dress! I went to the fabric store in search of flannel for a future archer and stumbled upon a pattern sale. 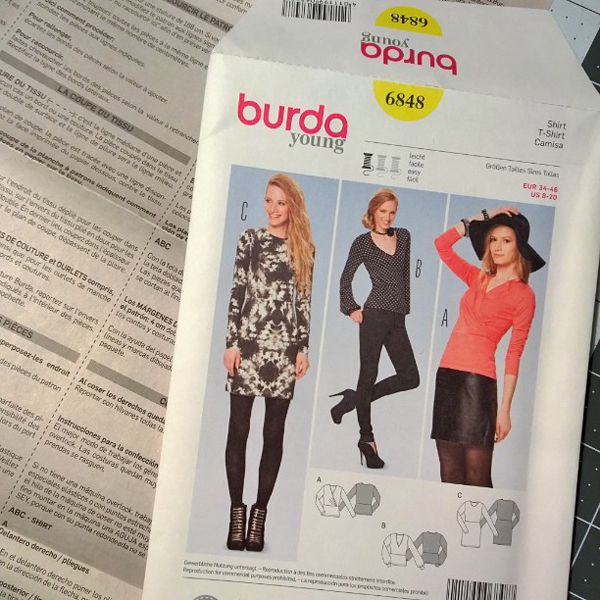 I haven't bought paper patterns in a while, mostly relying on Burdastyle magazine to suit my fancy but I thought that this was such a great basic and for only $2.50 I could not resist. I also got a trouser pattern and dress pattern and I'm so glad I did since my closet is now full of empty hangers. I made this dress mostly with the intention of wearing it to Brett's Christmas party for work, but it's a silhouette that I can wear on a regular basis as well. It's made of a ponte knit which has enough stretch to fit curves but is sturdy enough that it has a slimming effect, don't want my mama gut showing! I also love how big the pattern is, I was a little apprehensive about looking like I was covered in polka dots from head to toe, but the proportions are perfect for this print and shows just enough leg to keep it balanced. I traced the pattern from the sheet so I didn't have to cut into it, another thing I'm trying to do is keep my pattern drawer cleaned out and organized. I cut a size 4 but I think next time I'll go down a size. I had to take it in on the sides because I didn't take into consideration the negative ease and the shoulders are a little too long. I shortened the sleeve pattern by 1/2 an inch but I ended up having to shorten the sleeve even more, like way more, 4" more on the finished product. I however did not have to shorten the bodice of the dress or the skirt, those were perfect length which I find surprising, I must just have freakishly short arms! I love the proportion to this dress! I mean, my booty looks good! I will definitely be making another dress from this pattern, it was so simple and fast. maybe a short sleeve one for spring, hmmm... I'm getting a little ahead of myself. So there it is, the first and newest addition to my bare closet. My flannel archer is on the table mostly done. I ordered a bunch of buttons on Ebay and they won't come for at least another week. Ugh, I hate waiting. I cheated and made a trip to the fabric store and finished my flannel Saturday. I told you I hate waiting! Such an awesome dress! I love it! You look great! Thanks! I love this dress! I would love that! Thank you! Thanks I will let you know when on this post. Great dress but I really wanted you to know how much I love your hair!! Awesome. Thank you! It's really fun, and a reminder to not take myself so serious. To be featured on SSB tomorrow, thanks for permitting. A fabulous dress! Love that fabric!! !